Warm summer day, long weekend in the gorge. What else is there to do then visit new breweries? 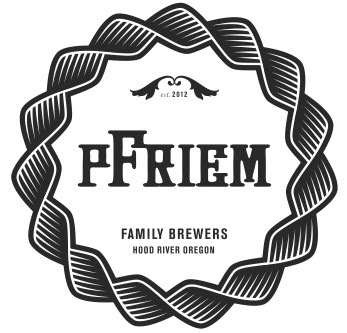 This trip found us in Hood River with a special visit to Pfriem Brewing. Located on the beautiful waterfront, this spacious location will be a good place for family a friends to gather and spend quality time together. Not yet open to the public, it was nice to tour the location before the crowds set in. Josh in front of some of his first kegs. Our host was Josh Pfreim, an accomplished brewer. He was kind enough to meet us on a Saturday to show us around. The tap room interior is made mostly of reclaimed barn wood, creating a warm environment. Also a large room upstairs for group events. The brewery is spacious and very well laid out for new additions down the road. Also, there is some extra storage space in the brewery for cellaring. We had expected the visit to be brief, but after the tour Josh invited us to sit down for a pint. They had just kegged the first batch of beer the day before. So after a small wait for Josh to hook up the taplines, we sat down and talked over a Blonde IPA. The beer and company were both very enjoyable. Just announced is AUGUST 4th ~ Tasting Room Grand Opening. If you can't make the drive, you'll be able to meet Josh and sample some fine beers on July 19th at Bazi Bierbrasserie from 6-9pm. I would recommend checking it out, and finding out what Pfriem is for yourself. I'm sure you won't be disappointed.